Don't you love a dish that looks like a really special yet takes less than a half an hour to make? I feel like this is one of those dishes. We had it on a Monday night but I could see making it for a special occasion dinner for two. Maybe it's because I think of lamb as a special treat that I only get at restaurants. 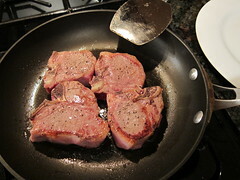 Anyway, this is dead simple, you just quickly sear the lamb & then make a red wine & balsamic sauce in the same pan. We really liked the tanginess of the sauce with the slight gaminess of the lamb. I served the lamb with a side of Kashi 7 Whole Grain Pilaf. I cooked the pilaf according to the directions & then stirred in 1 tablespoon fresh parsley & 2 tablespoons of golden raisins when done. 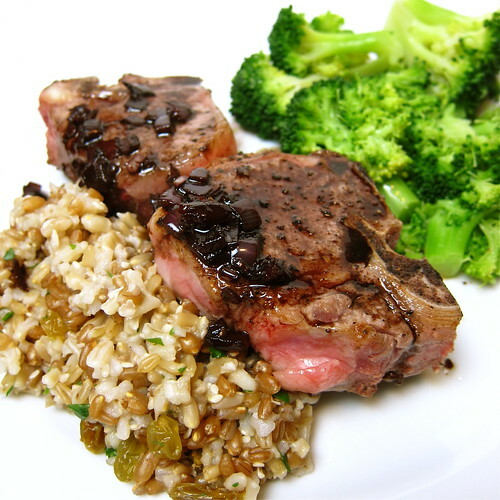 It had a great textured, tasted wonderful with the balsamic sauce & one servings has a days worth of whole grains in it. Heat the olive oil in a nonstick skillet over medium-high heat. Salt & pepper the lamb chops on both sides & put in the pan. Cook on one side for about 3 minutes, until browned. Flip & cook on the second side for 4 more minutes. (This will give you a rare to medium-rare chop, cook longer if you wish.) Remove the chops to a plate & tent with foil to keep warm. Put the onions & garlic in the skillet, cook until the onion is translucent. Add 2 tablespoons of the red wine & bring to a boil. Cook until evaporated. Add the remaining red wine & vinegar boil until reduced by about half. Taste & season with salt if desired. kat, this looks like a dinner from a 5-star restaurant! The lamb with the balsamic sauce looks rich, succulent and delicious. Great recipe, thanks. This looks awesome- I love lamb and saw this recipe in Cooking Light and now I know I need to make it! don't hate me kat, I'm not a lamb person but I had to comment on the balsamic sauce as you know I love a good sauce. Looks fantastic! I agree, lamb is easy to cook! Wish it was more available here in FL. It goes great with balsamic! although the lamb is quite enticing, i wondered what is was perched on. i love kashi products, and your addition of golden raisins is brilliant! I have some lamb chops in the freezer waiting to be used. This looks like a great recipe for them! I've only had lamb once and didn't really love it. I need to try it again! I've always wanted to try making lamb at home, but haven't yet. Sounds like this would be the recipe to try. I havent had lamb in a long time. This looks absolutely delicious. The glaze looks super...tart and sweet at the same time. All hail lamb. great recipe. followed your directions to a T and it came out med-rare as advertised. Hubby and I loved it. Will be making again. thanks!